What is Ultrasound Imaging of the Scrotum? What are the limitations of Scrotal Ultrasound Imaging? 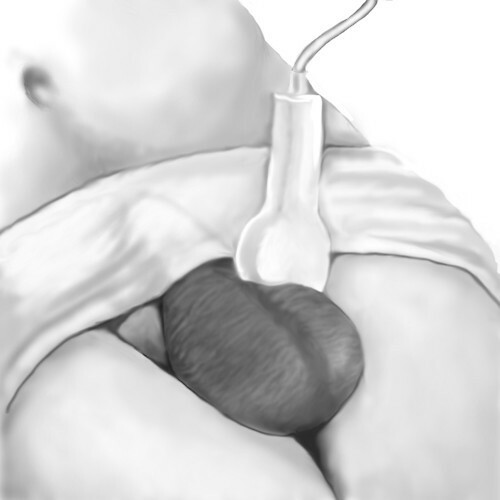 Ultrasound imaging of the scrotum provides pictures of the testicles and the surrounding tissues of a man or a boy. 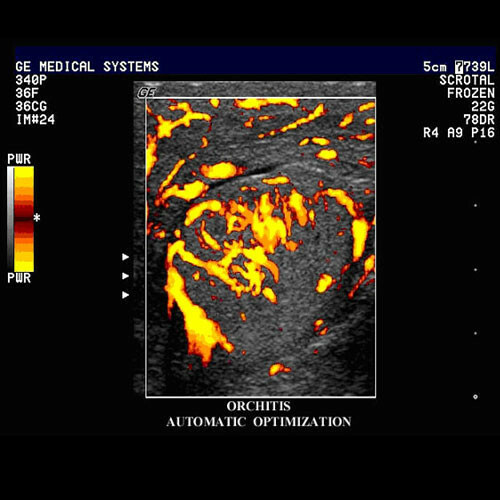 Ultrasound imaging of the scrotum is the primary imaging method used to evaluate disorders of the testicles, epididymis (a tube immediately next to the testes that collects sperm made by the testicles) and scrotum. Look for the location of undescended testis. 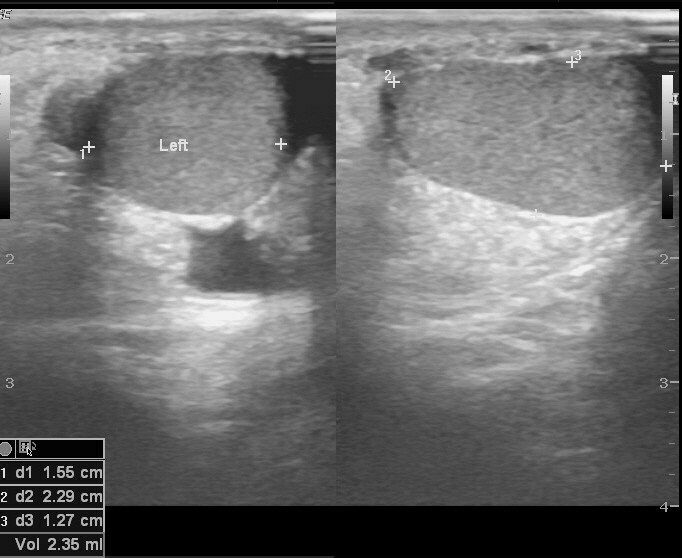 Ultrasound is also a valuable tool for evaluating the epididymis and the prostate. A sudden onset of pain in the scrotum should be taken very seriously. The most common cause of scrotal pain is epididymitis, an inflammation of the epididymis. It is treatable with antibiotics. If left untreated, this condition can lead to an abscess or loss of blood flow to the testicles. 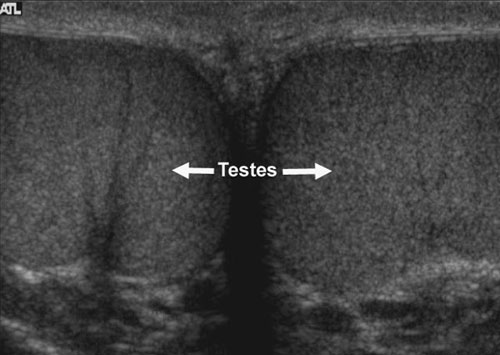 Ultrasound can often detect an absent or undescended testicle as well. It is estimated that approximately three percent of full-term baby boys have undescended testicles. The testicle normally migrates from the abdomen, down the inguinal canal and then into the usual position in the scrotal sac. If it is not present in the scrotal sac, it may have stopped on its way and lie in the inguinal canal, in which case the ultrasound examination will often see it. If it has not left the abdominal cavity, it may not be seen by sonography. If a testicle is not detected, a urologist may be consulted in order to decide whether additional imaging such as an MRI is needed to determine its location. If the testicle is found to be in the inguinal canal, it can be moved into the scrotum. If left in the abdomen too long, it may become cancerous and may need to be removed. 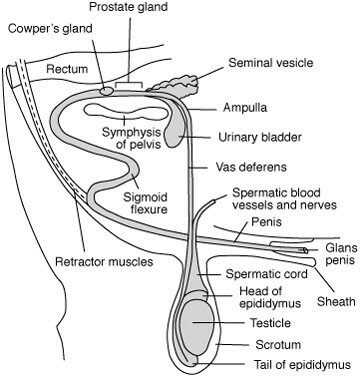 In order to perform a scrotal sonogram, most commonly a linear small parts transducer is used. This ultrasound examination is usually completed within 15 to 30 minutes, though sometimes more time is necessary. 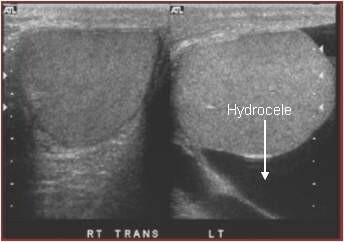 Ultrasound of the scrotum is helpful for finding abnormalities such as masses in the scrotum or testicles. However, it does not always permit an exact diagnosis (i.e., the exact type of tissue a mass is composed of, especially when the mass is solid). Blood flow images of the testicles are not always reliable in determining if the blood supply to a testicle has twisted. When searching for an absent testicle, ultrasound may not be able to find it if it is located in the abdomen because gas filled bowel loops may block the view.